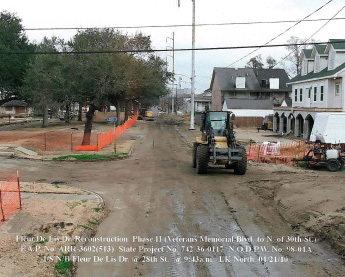 Design Engineering, Inc is under contract with the City of New Orleans and the Louisiana Department of Transportation and Development to provide construction management and construction inspection services for the referenced project. The project construction period is 250 calendar days and the value of the construction contract is $10,804,998.00. On-site project representative services will be provided for construction of roadway, drainage structures and drain lines, sewer lines, Class II Base Course, Portland Cement Concrete pavement, Superpave asphaltic concrete pavement, water distribution system, placing pavement markings, landscaping (tree removals and replacement) and relocated work. The entire construction administration for this project was managed through Site Manager (i.e., change orders, daily reports, generating monthly estimates and pay request. Scheduled and attended the preconstruction meeting. Conducted the meeting and maintained minutes of the meeting. Maintain all construction field records; make daily entries in the project diary to indicate the Consultant’s personnel and equipment being utilized on the project, the work being accepted, the acceptability of traffic control, and the charging of contract time. All of these activities were managed through LADOTD’s Site Manager Program; Critical Path Scheduling; Primavera P6 Software. Coordinate with the City Engineer/Representative for all relocations/adjustments of utility facilities for the construction of work site. Inspect the Contractor’s construction operations (daily) to ensure that all work is performed in accordance with the specified plans and specifications. Keep clear and concise records of the contractual operations, prepare monthly pay estimates, and make monthly progress reports in conformance with the DOTD’s requirements. Prepare final estimate packages, including Form 2059 – “Summary of Test Results” in conformance with the DOTD’s requirements. Review all form work drawings and submit to the DOTD for further handling, review, and distribution. Coordinate construction activities between engineer, owner, DOTD and FHWA. Follow DOTD procedures for reporting and documentation of pay request. Participated in conferences, visited job site, and participate in inspectors by DOTD representative. Prepare and submit as-built plans with the final estimates. Prepare plan changes and change orders. Monitor and document construction claims and provide recommendation on disposition of claims.